This season, beauty trends are leaning back towards beauty trends of the late ’90s and early ’00s: bright colors, glitter, lip glosses. Rather than simply repeating beauty styles from twenty years ago, however, brands are taking the best parts of that era and reimagining them in a modern style. One of the biggest trends this season, distinguishing it most strongly from prior seasons, is the embrace of glitter in cosmetics. Numerous brands have released glitter-focused eyeshadow palettes and single eyeshadows, and glitter lipsticks and glosses are showing up all over the place. It’s a more forward expression of the “unicorn” trends and the high-shine highlights that have been prominent for some time now. For a sophisticated night out, mix glitter makeup with more subdued matte tones. Try a warm-toned glitter eyeshadow on your mobile lid blended into a complimentary, neutral matte in your crease. Then, draw a thick black wing with a liquid eyeliner and paint your lips with a deep blood red. Conversely, you can also keep your eyes fairly neutral and go with a sparkling lip. Keep the rest of your face fairly neutral and natural, and the small pops of glitter will keep you shining all night. 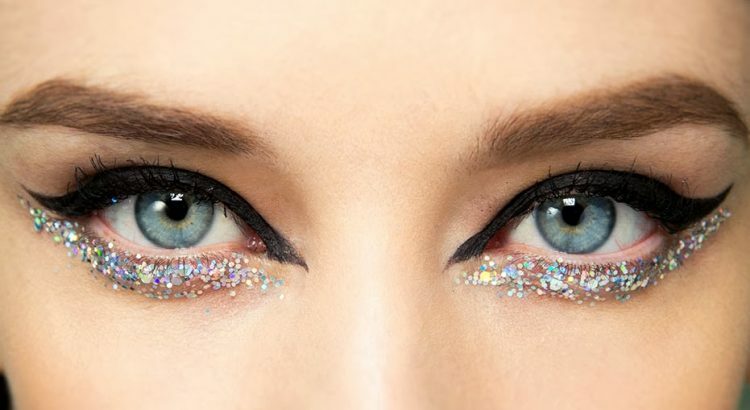 If you’re looking for something more playful, try going all glitter. Use a bold, high-shine shade on your mobile lid, and blend it into a complimentary color that has more of a subdued shimmer in your crease. A complimentary glitter eyeliner will draw attention to your eyes, while a dark yet glittery lipstick will pull the whole look together. Article submitted by Dev Randhawa, who is a US born fashion blogger with a passion for winter fashion trends.